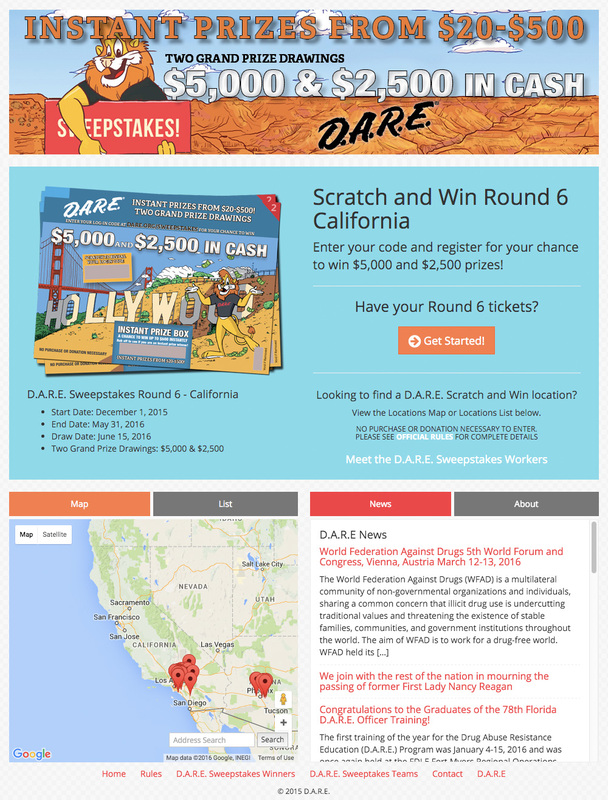 DARE Sweepstakes is a sweepstakes entry platform which provides DARE Scratch & Win Card purchasers a means to register scratch cards and enter to win cash prizes. Purchasers enter unique codes from the scratch cards to claim their entry and be notified of sweepstakes updates. The site features Google Maps and DARE website feeds to provide up-to-date Scratch & Win information. Pomp Productions developed and built the sweepstakes platform and designed the card generator algorithm which can be used across multiple scratcher card campaigns. Each campaign has a physical component of 40k printed Scratch & Win Cards and an online component where card purchasers can register individual cards for a chance to win additional prizes. The platform includes a custom content management system featuring real-time reporting of entry and campaign details. The platform is built on top of WordPress and features a mobile responsive theme.